I need to get my blog caught up! I had a full day today, starting by waking up at 6a for the opportunity to photograph Hillary Clinton (I think that I got a few good shots!). We had a few appointments in the evening; it was around 8p when I started working on dinner. Just then, my Mom called to say that she had an extra pizza that she had just made. 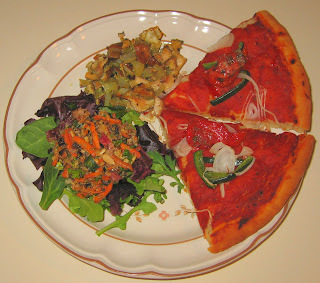 I capitalized on that and enjoyed her always-very-good homemade pizza. I served a sweet and spicy mixed grain salad (millet, bulghur, wild rice, tamari, sunflower seeds, carrot, red onion, scallion, dried cranberry, mint, lemon juice, tamari, cayenne, black pepper, parsley, white wine vinegar, olive oil) that I had purchased, and made a simple saute of tempeh, onion, and shiitake mushrooms, mixing in 3/4 tablespoon of pesto just before serving. I write this entry in early 2009 (January 10th) - I found unprocessed pictures from April 26-May 1. Please excuse me but I am just going to post the images and dinner titles, as I have long forgotten the details of these meals! I made a simple dinner tonight. We ate out after my photography class last night and enjoyed an excellent vegan pesto on crispy pizza from Panzanella's in Carrboro. 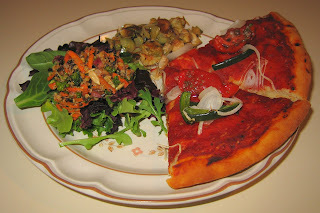 I heated a leftover slice for each of my wife and my plates. 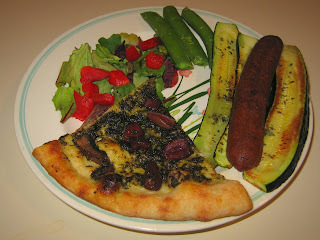 I grilled a vegan apple-sage sausage along with zucchini, which was good. 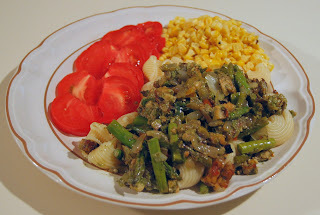 I made a simple asparagus and tempeh saute and served it over Conchiglie seashell-shaped pasta. I also grilled some corn over my gas range, stripped the kernels, and served it with Earth Balance vegan margarine, a little lime juice, and a little salt - one of my standards. Late last year, I made a contribution to a local cause and received a shiitake mushroom log as a "thank you". I was told that I could actively manage the log by periodically drenching it, and then would get a number of mushrooms mushrooming at a time. Or I could just let the log be, laying in a shady area in my back woods, and would occasionally get a mushroom or two. I chose the latter - it also would last longer this way and I think give a larger total number of mushrooms. I was delighted a few days ago to find two very large mushrooms growing on the log! Today I went to get them but one was gone - I don't think that squirrels or other animals eat them, but may be wrong. There was no trace of one. But the one that I harvested was huge and heavy! I made a simple dish out of it, cooking it in a little bit of oil, shallot (or was it onion? ), and herbs. I served it with some dried garlic and salt. Delicious! I photographed a wedding reception today, coincidentally at the restaurant where I host Thanksgiving each year, Cafe Parizäde. 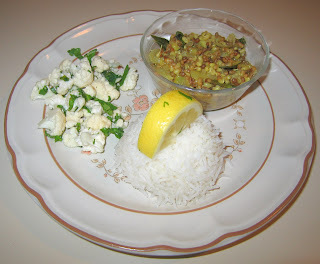 I came home hungry and tired, and was so happy and thankful to see that my wife, who had eaten out at Sitar India Palace, brought home a tasty potato-cauliflower-spinach dish, as well as rice. It was very good! Today I put together a quick dinner (as we were off to see a Gilbert and Sullivan performance that a good friend was performing in, The Yeoman of the Guard) that I initially wondered whether or not it would be filling - it was! I sauteed on medium heat thin strips of tempeh; as the tempeh just started to show some browning, I added halved okra spears. After about five-seven minutes, I added strips of red bell pepper and cooked for just two or so more minutes. Then I added a little soy sauce (maybe a tablespoonful), let it sizzle, and turned the heat off. 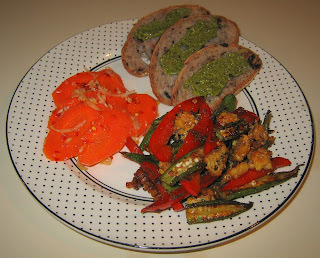 I sprinkled some jerk seasoning over the dish and served it, along with slices of olive bread having smears of pesto, and pickled Thai carrots. The carrots were purchased; they contain carrots, sesame seeds, shallots, garlic, rice vinegar, sugar, salt, chili pepper, and canola oil. I had a busy and fun day - I was delighted to get to photograph Barak Obama in the early afternoon and then had a new photography class starting this evening. My wife is taking advantage this week of a sitarist visiting from India, and is getting lessons. She ate something on her own earlier. 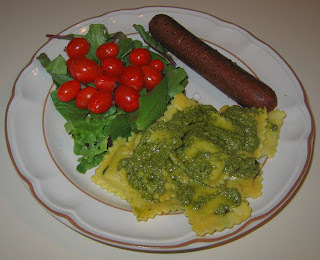 I came home from class and made some frozen vegan Rising Moon Organics ravioli , (I think it was Spinach Florentine), and topped it with pesto. I also heated with very little oil in a cast iron pan spicy vegan Mexican Chipotle sausage by the Field Roast Grain Meat Company. 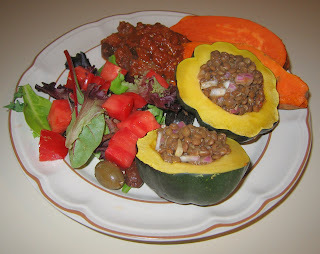 My wife had made some lentils a few days ago; I simply cooked some small acorn squash halves (I put them cut side down in a plate with a little bit of water and put them in a 375°F oven for about a half hour) and served the lentils within the squash cavities. 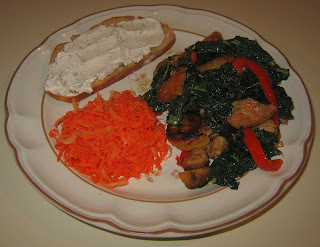 I also baked some sweet potatoes, and finished off the Trader Joe's Sicilian Caponata that I had recently purchased. On this day when our annual federal tax returns are due, I made another simple meal. I prepared green chard, leaf and stem, by cutting it into 1/4" wide strips. I started sauteeing over medium heat a third of a yellow onion, cut into a dice of approximately 1/4"; as the onion started to clear, I added the chard and cooked for approximately five minutes till it was cooked through, and added a little salt before serving. 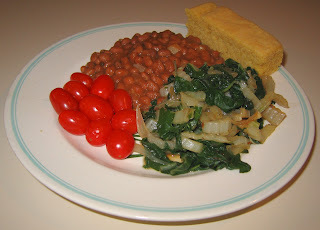 I brought back some cornbread from Sticky Fingers this weekend, and served it with some baked beans. It was a filling and tasty meal. We had a very nice weekend in Baltimore and Washington, D.C., attending my Johns Hopkins reunion. On Saturday, we had our class banquet; my wife and I put together a reasonable meal of hummus, vegetables, a nice rice dish, and green beans. 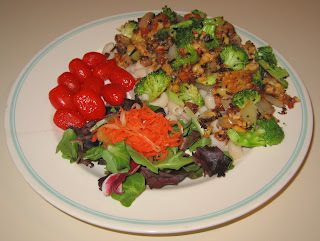 Today, I made a simple dinner, using the seitan that I served atop rice noodles. The seitan was good - but then my wife and I almost always love seitan. I also made a simple saute of Brussels sprouts and green beans. It was so nice outside today that we ate our shiitake mushroom saute outside! 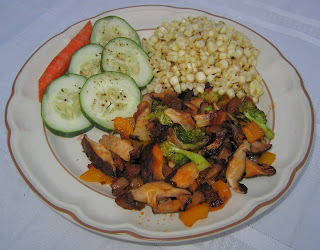 It was a simple dish with mushrooms, broccoli, and yellow bell peppers. I also served some corn-off-the-cob and salad. I have never cooked with galangal root, also known as "blue ginger" and commonly used in Thai cuisine. I purchased a little piece a little less than an inch long and less than half an inch thick, and, after peeling the skin away, cut it into small cubes, thinking I'd experiment with it in a dish. I started sauteeing in a cast iron pan with olive oil (I always use extra virgin) about half of a package of tempeh, cut into rectangles maybe 1/2" x 1/2" x 1/4". After four or five minutes, when the tempeh was light brown over medium heat, I added half of a sweet onion, cut into large 1/2" or so chunks. I let that cook for a few minutes till the tempeh was a little browner and the onion started to clear, then I added two small handfuls of broccoli crowns, and let it all cook for another two minutes or so, letting the broccoli get deeper green. Then I added the galangal root and maybe two teaspoons of pine nuts; being careful not to let the pine nuts get brown, I added a little salt and about 1/4 or 1/2 teaspoon or so of tarragon, mixed, and served over organic brown rice elbow pasta by Tinkyada (ricepasta.com) . 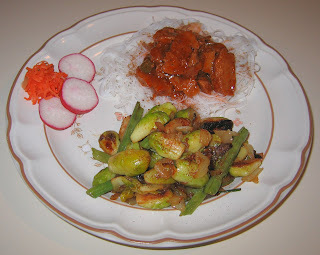 I also put some fermented carrots atop lettuce and served some grape tomatoes. The main course was surprisingly good! I loved the unusual flavor that the galangal added. I can't think of a good way of describing the galangal's flavor, but it really wasn't like ginger, as I had expected. Maybe after cooking with it more, I'll be more articulate in describing it. Unfortunately, I ate out again last night. I was excited to have the opportunity to photograph Michelle Obama's talk in Raleigh NC last night. My wife didn't come but said she would eat leftovers; by the time I was done, it was past 10p, and I decided to stop at a Lebanese eatery for a falafel platter and something like kosheri - it was okay but I probably should have just made a quick meal at home. Full Frame! It was, as always, great. Some of my favorite films included Man on Wire, about a man in the mid-70s who tight-rope walked between the World Trade Center towers for 45 minutes; Glass: A Portrait of Philip in Twelve Parts (I was surprised to see my ex-roommate sitarist Kartik Seshadri in the film several times and even have Philip Glass talking about him! ); Good Ol' Charles Schulz about the famous Peanuts cartoonist; Neither Memory Nor Magic, a very touching story about Holocaust victim, Hungarian poet Miklós Radnóti; Flow: For Love of Water (predictably I asked the director why the major impact of a non-vegan diet wasn't mentioned); and A Promise to the Dead: The Exile Journey of Ariel Dorfman about Ariel Dorfman, a kind Duke professor of literature who served a senior position in the Chilean government of Salvador Allende and who was exiled in the coup that brought General Augusto Pinochet to power. We were at the Festival each night till 10p or later (as late as a bit past 1a). On Thursday, my wife and I went with the director and editor of another great film that I had seen before the Festival, Flying On One Engine, a remarkable film about idiosyncratic humanitarian Dr. Sharadkumar Dicksheet, to eat a quick falafel meal at a nearby eatery. On Friday, I went on my own to Whole Foods, and was surprised that they had good Ethiopian food on their hot food bar, which I enjoyed for dinner. On Saturday, we went with the filmmaker of Salim Baba, which I already described on March 14, to Vita, newly remodeled from Cafe Verde and part of our big annual Thanksgiving bash, where we had a too-hurried delicious pizza dinner. Finally, we had a not so great pasta dinner at George's Garage around 10p after the Festival ended on Sunday. I made a very simple meal tonight. I was out leading a photography workshop (check out the story of the Sisters' Garden) and then, after grocery shopping, had limited time before my wife returned home from a meeting and before she had to leave for a class she's taking. At Whole Foods Market, I sampled from their hot prepared food seitan scaloppini. Scaloppini is a technique of preparing food by sauteeing thinly pounded pieces of food (I guess typically meat), coating it with flour, and sauteeing it. I'll have to try this sometime, but for today just picked up this prepared main dish. 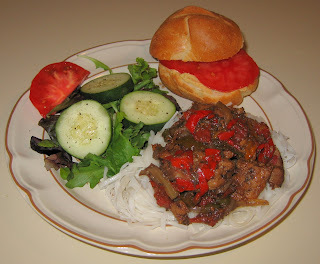 I served it over rice noodles, and also served a little sandwich with hummus and tomato. It required very little work, and was tasty! The Full Frame Film Festival was, as always, excellent. I hope to have more to say about it, as well as our dinners that we had during the Festival, soon. 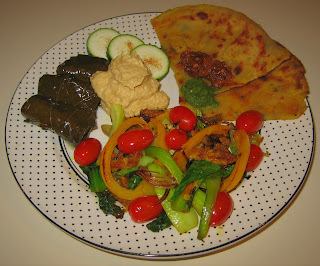 I put together a dinner fused with Middle Eastern (purchased stuffed grape leaves in extra virgin olive and lemon hummus) and Indian (leftover stuffed parathas from eating out on Sunday and vegetables that I cooked in an Indian style) influences. For the main course, I sauteed thin strips of tempeh for a few minutes till they started to brown, then I added a shallot, cut into thin slices, as well as strips of yellow bell pepper. In the meantime, I prepared a stalk of baby bok choy. I cut the leaves from the stems then cut the stems into thirds or halves along their lengths. 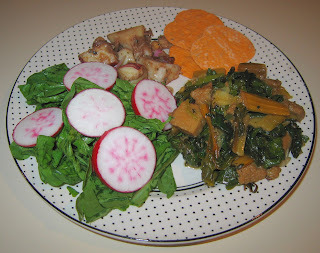 A few minutes after adding the shallot and pepper, I added the bok choy whole leaves and stem pieces. I cooked the bok choy down for a minute or two, then tossed in grape tomatoes, maybe 1/8 teaspoon ajwain seeds (cumin would be better but I had ajwain handy), and about the same amount of turmeric, as well as a few pinches of salt. I let the tomatoes cook for a minute or two till they were threatening to pucker, then I served the dish. We enjoyed dinner! This is likely my last home-cooked dinner till Monday - Full Frame begins tomorrow morning (yeah!!)! I prepared conchiglie pasta, shaped like seashells, for the first time in a while. 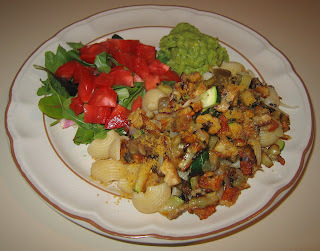 I simply made a saute of finely cut tempeh, zucchini, and eggplant, and served it atop the pasta. 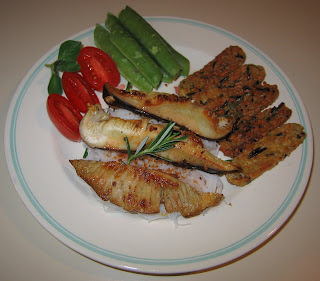 For the saute, I started off with tempeh and about 3-4 minutes later, added eggplant and onion. 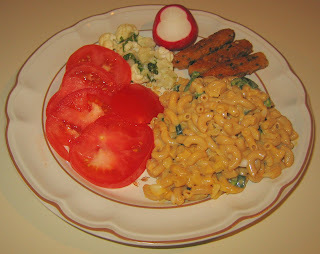 A minute or two later, I added the zucchini, and cooked till the zucchini was softened and the tempeh became medium brown. I also served a little bit of deliciously prepared guacamole, as well as tomato and a lettuce mix. I found that while I was gone this weekend, my wife had picked up a few groceries, including kale, which she is fond of. 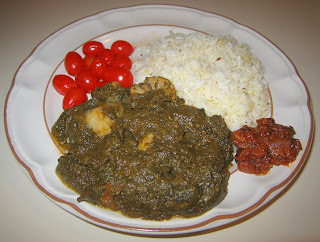 I prepared a dish, similar to what I did this past February, but used a nicely ripened plantain (it's good to let the plantain's skin get nice and dark) instead of banana. I cut a tub of seitan into large chunks and started sauteeing them. When they started browning, after perhaps 5-6 minutes on medium heat, I added a shallot that I had cut into long slivers, half of a red bell pepper, cut into thick (maybe 1/4") slivers, and a peeled plaintain, cut into discs maybe 3/8" thick. In the meantime, I hand stripped the kale into roughly 1" squares, leaving the stems behind. I added the kale about 5 minutes later, when the plantain was browning, and let it cook for another 5-7 minutes, cooking the kale down. I then added several tablespoonfuls of Baja Lime marinade and a little salt, and let the marinade cook into the other ingredients for a minute or two. Back when we visited Savannah in February, I found packages of Bio Lacto / Deep Root brand fermented organic raw cultured vegetables. The products of theirs we found were fermented carrot, beet, and daikon radish; we bought a packet of each except the radish. I enjoyed the carrot that I served today; my wife found it a little sour to eat "straight". I have some left, and will try combining it with other ingredients when I serve it again. I also served a slice of lemon rosemary sourdough toast with Scottish Sheese spread. It was a good dinner! I last cooked on Thursday. I flew to Columbus, Ohio to do an engagement photography session, and enjoyed eating at Dragonfly that first night. At this gourmet vegan restaurant, I had risotto (good but frankly I like mine better) and an excellent rice pudding - cookie dessert that was hot and cold in different areas. On Saturday night, I was in Cleveland scouting the church for the May wedding, and ate at Aladdin's Eatery. When I had last visited Cleveland in 1994, I enjoyed eating here; it offers great Middle Eastern food. Alas, they fry their falafel patties in the same oil as they fry meat, but I loved their hummus, thin pita, and a lentil-rice dish similar to koshari that I loved when I was in Cairo in February 2003. I flew back early on Sunday and was able to enjoy much of the Triangle Jewish Film Festival, seeing an exciting documentary, Doubletime, about jump rope competition (including of a local Chapel Hill team, the Bouncing Bulldogs); another very good documentary about the city that I live in, Durham: A Self-Portrait; and Starting Out in the Evening, a nicely done film with nuanced acting about an ambitious and forward graduate student who seeks to understand an elderly novelist through interviewing him. We ran out in the 50 minutes in between the last two films to Cool Breeze, an Indian "chaat" (snack) shop, and enjoyed stuffed paratha breads and a savory snack of samosas broken up with other snack items. Columbus was good to visit. They have good vegan and vegetarian dining choices - I enjoyed the mostly vegan Benevolence Cafe for lunch after the photography on Saturday, where I had good soup and a cinnamon bun. I brought home delicous desserts! The Whole Foods in Columbus is supposedly the second largest branch (next to the mother store in Austin, no doubt) in the company! It was big and well laid out. I heard about but didn't get a chance to visit Pattycake - an all-vegan bakery! And, last but by no means least, I was delighted to get to visit my friend Sangeeta Kumar, artistic blogger of The Veg Lounge (whom I had mentioned on March 7th), and her husband.